IBM celebrated the 16-month anniversary of its IBM Watson business unit this week with a two-day event at Duggal Greenhouse on edge of the East River in Brooklyn, NY. The event was about showing that within less than two years, the commercial potential of IBM Watson is finally blossoming into reality. The notion of “scaling up” was thematic at Tuesday’s kickoff. Mike Rhodin, IBM’s senior vice president in charge of Watson, described the cognitive technology as “scaling knowledge” – quickly distilling problem- or question-relevant insight from vast corpuses in any given industry. Given the scale of data today, that’s something no human or even an army of humans could manage. But the point is to advise and assist human decision makers, not replace them. IBM CEO Ginni Rometty cited evidence that the Watson business is quickly scaling up, attracting “tens of thousands” of developers, hundreds of partners, and growing list of companies deploying Waston apps. She cited Development Bank of Singapore (DBS), which put an investment-advisor application into production in March. Deakin University in Australia has a Watson-powered student-advisor app that’s exposed to some 50,000 current and would-be students, she said. She also mentioned Bumrungrad International Hospital, a million-plus-patient-per-year institution in Thailand that has deployed an oncologist-advisor app. 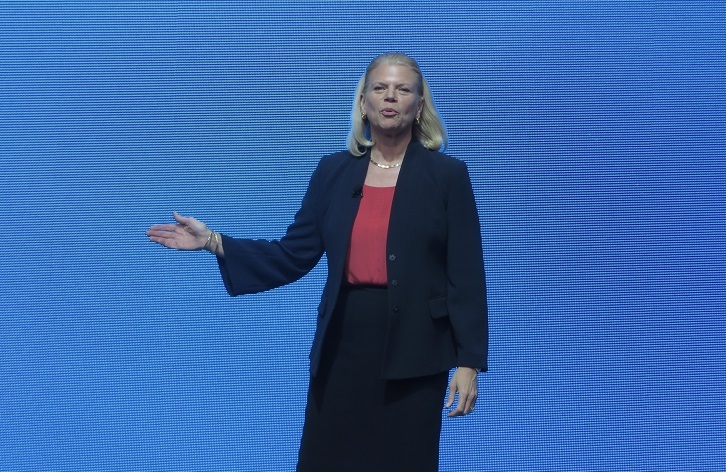 IBM CEO Ginni Rometty keynotes at the May 5 World of Watson event in Brooklyn, NY. The number of in-production deployments isn’t vast and we’ve heard some of these references before. But that’s not surprising given that it takes time to train sophisticated cognitive applications. DBS, for example, spent a year training its Watson investment-advisor app on economic metrics in the bank’s 17 Asian markets, on the many investment options it offers, and on customer profiles. The app saves time by quickly combing through up-to-the-minute data to recommend appropriate investment options given the risk appetite, preferences, and past trading behavior of individual customers. The app was exposed to some 300 customer relationship managers at DBS in March. These advisors can “like” or “dislike” Watson recommendations, social-network style, to help with ongoing training, according to Olivier Crespin, head of digital banking at DBS. The system also shows confidence scores behind recommendations and offers details on why specific investments might make sense. Medicine was the first real-world application IBM envisioned for Watson way back when it won the TV game show Jeopardy in 2011. Indeed, that’s the field where the technology is most mature. IBM spun out a dedicated, 2,000-employee IBM Watson Health business unit one month ago, and on Tuesday it announced a Watson Genomics initiative in partnership with more than 14 leading cancer institutes. The goal is to use Watson’s cloud-delivered processing power to speed and scale up the matching of patient- and tumor-specific DNA with best-fit treatments based on prior clinical results. UNC’s cancer center has done DNA sequencing on 1,700 patients since 2011, but Sharpless says the institution needs Watson’s help to scale up prediction and delivery of personalized treatments to as many as 4,500 patients per year. MyPOV: Despite the training factor, IBM did cite examples of new cognitive computing apps that were developed in a matter of weeks. Deakin University, for one, rolled out its student-advisor app in about four months. In another example, IBM recently developed a media-exploration app in partnership with TED Talks within about two months. The app applied Watson’s unstructured-data and natural-language processing power to a collection of more than 1,900 TED Talks videos. Demonstrated on stage at the event, the app accepted natural-language questions about ideas or concepts, and Watson queue up relevant video clips, jumping to the precise moments in the TED Talks in which that concept or idea was discussed. A novel app for fast media searching won’t “change the face of the industry,” as IBM CEO Rometty said cognitive computing will do in the field of healthcare. But scaling up in any industry or application area will take time. IBM is clearly investing for the long haul, even as it’s under enormous pressure to return to growth and improve its financial performance. Rometty concluded her remarks with a plea, of sorts, for customers to join in the effort to scale up Watson. Recommendation: IBM Watson is at the nexus of companies and industries overwhelmed with information and human decision makers struggling to make smart decisions and to offer well-informed advice to customers. If that description fits your company, you might consider cogntive computing even if you’re not looking to “change the world.” If Watson and cognitive computing is going to become more approachable, we’ll have to see a lot more lightweight apps and uses of Watson such as the TED Talks app. Think of it as scaling up cognitive computing one small app at a time.